If you’re struggling to come up with gift ideas for a Dodgers fan, we can help! 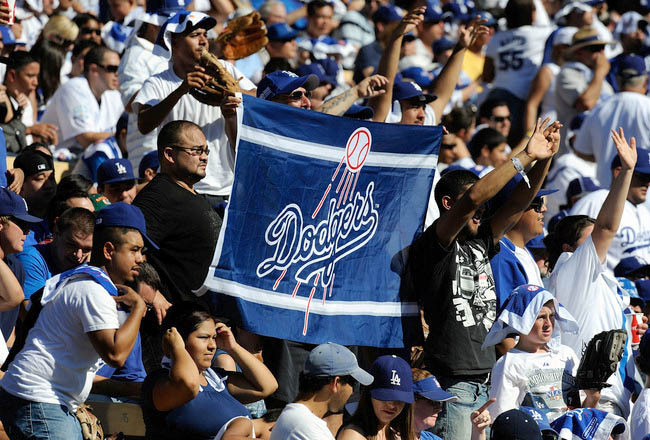 Here are 6 awesome gifts that’ll surprise the Dodger fan in your life. Father’s Day is right around the corner. Have you planned your gift for your Dodgers fan dad yet? If not, it’s getting to be that time. Maybe your die-hard LA girlfriend’s birthday is coming up. Bet she’d love some sweet Dodgers gear to tote to the next game! There are tons of awesome, creative Dodgers branded gifts out there for all the dads, girlfriends, boyfriends, sisters, and even pets who can’t get enough of LA baseball. Here’s a roundup of the best six gift ideas for a Dodgers fan. Happy shopping. Let’s start with the biggest, best gift a Dodgers fan could ask for: Dodger tickets. Nosebleed seats cost as little as $14 per ticket this season. Who cares if you’re super close, right? The real experience of going to a ball game is in cheering your team on with the rest of your section, hands full of Cracker Jacks and beer spilling on the floor. If you’re searching for the perfect holiday gift, look no further than this sweet Dodgers Christmas sweater. It’s kitschy enough to wear to an Ugly Sweater party but authentic enough to rock for real on Christmas morning. Bonus: matching sweaters for their mugs! This Dodgers desktop pen caddy is perfect for the office or to keep next to the grocery list notepad in the kitchen. It could also be used to store wooden spoons in the kitchen or toothbrushes in the bathroom. You could even drill a hole in the bottom to create a Dodgers helmet succulent planter! In the winter, your favorite Dodgers fan will love cozying up in these cool Dodgers socks. Paired with their Dodgers sweater, they’ll be all set with comfy home gear! The Anthem socks are a classic cherry red that just beg to be worn with shorts and sneakers in the summertime. Does your Dodgers fan have a big, blank wall in their living room or bedroom that’s dying for a little home decor? Gift them with a Dodgers flag to give that space some love. You could also gift them some outdoor flags for their lawn, so they can show their LA pride off to the neighborhood. This is a little pricier of a gift than most gear, but it’s pretty invaluable to a Dodgers fan. Duke Snider was a 1950s hitter, two-time World Series champ, and eight-time All-Star all while with the LA Dodgers. He’s pretty much a legend. There are only so many Duke Snider signed baseballs left in the world, and we’re willing to bet your Dodgers fan would like to get their hands on one. Gifting doesn’t come naturally to everybody. Hopefully, you’ve pored over these gift ideas for a Dodgers fan and found the perfect one for a loved one’s next birthday, Father’s Day, or Christmas present. Got another recipient in mind? Check out these tips for choosing the perfect gift for your spouse this summer!